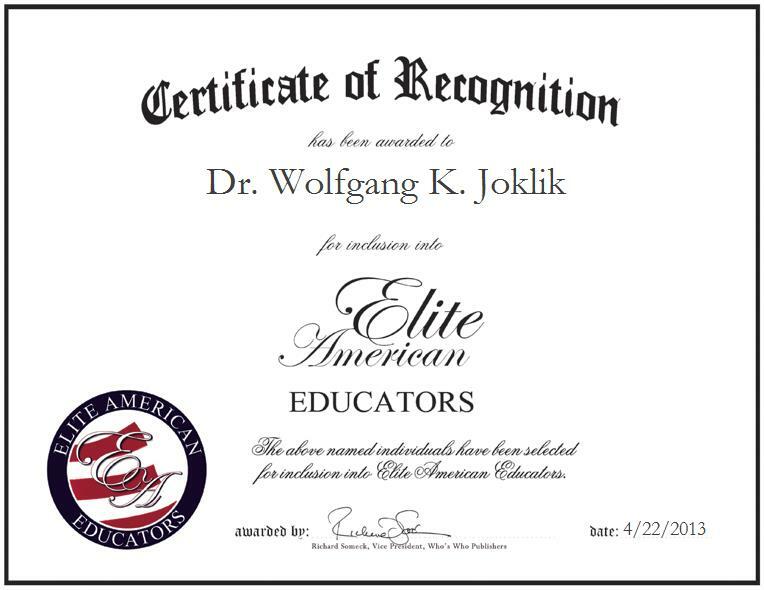 DURHAM, NC, April 22, 2013, Dr. Wolfgang K. Joklik, Chairman Emeritus of the Department of Microbiology and Immunology at the Duke University Medical Center, has been recognized by Elite American Educators for dedication, achievements, and leadership in microbiology and immunology. Dr. Joklik was born in Vienna, Austria, and spent his teen years in Sydney, Australia. He obtained bachelor’s and master’s degrees in biochemistry, focusing on enzyme chemistry and gaining a valuable foundation for further studies. He pursued a Ph.D. at the University of Oxford, studying the biochemistry of bacteriophages in the company of Nobel laureates and other world-class researchers. In 1953, Dr. Joklik joined the newly established Australian National University in Canberra, and became interested in working on molecular animal virology, included viruses related to smallpox. He continued this research after moving to the United States in 1962, when he joined the faculty of the Albert Einstein College of Medicine. Dr. Joklik also began to study retroviruses, which became his primary focus when he moved to Duke University’s School of Medicine in 1968. He was chairman of Duke’s department of microbiology and immunology from 1968 until 1996. The department started with six members and has now grown to 33 members; by the mid-1980s, it was ranked as one of the top three microbiology and immunology departments in the United States. During his tenure, Dr. Joklik served on numerous external review and administrative committees that provided him with valuable insights and personal contact with large numbers of scientists in related fields. He was one of two U.S. representatives to the World Health Organization’s Smallpox Eradication Committee, and in 1993 argued that existing stocks of smallpox virus should be preserved in secure scientific libraries, a viewpoint that ultimately prevailed. Dr. Joklik was also instrumental in getting Duke University approved as the site of a regional Comprehensive cancer Center, as part of President Nixon’s “War on Cancer.” The center is now in its 36th year and very successful. In addition, Dr. Joklik founded the American Society for Virology (ASV), the first organization in the world specifically for this branch of molecular biology. After initial discussions in 1980, the ASV was established in 1982, with Dr. Joklik as its first president. There are now about 3,500 members, including scientists from 44 countries in addition to the United States. Dr. Joklik has had a Distinguished Professorship named in his honor, as well as the W. K. Joklik Prize, which is awarded annually. He keeps in contact with his former students and colleagues, and consults and advises them whenever necessary. Upon reflecting on a successful career in microbiology and immunology, Dr. Joklik attributes his success to his education, and ability to research and earn awards. He was a leader and pioneer in both the basic and applied research arenas. He has been and continues to be an ambassador for the interferon and virology fields in a unique manner that spans the Austrian/German and British/American cultures. Dr. Joklik continuously strives for excellence in his every endeavor, paving the way for other innovators in his field who will look to him as a pace setter and modernizer.